The Chaos Ball is an amazing training tool utilized to build hand eye coordination and reaction time. Each multidirectional bounce will challenge every athletes ability to adjust quickly to catch the ball. Roll the Chaos Ball on any surface to create multidirectional bounces. Spinning the Chaos Ball during each ground ball we create a more intense change of direction. The Chaos Ball will challenge an athletes ability to quickly change direction. Roll the Chaos Ball naturally or spin the Chaos Ball to initiate spin for more intense directional changes. Let the Chaos Ball's textured edges do the rest. Each bounce will create a misdirection bounce to enhance the hand eye coordination and reaction time of each athlete. The Chaos Ball can also be used off the wall for individual use. 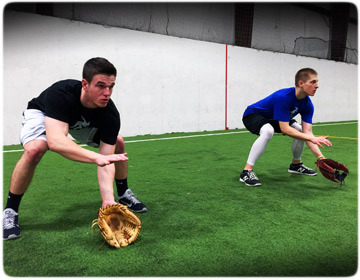 Each change of direction will enhance athletes' ability to react to a bad hop. 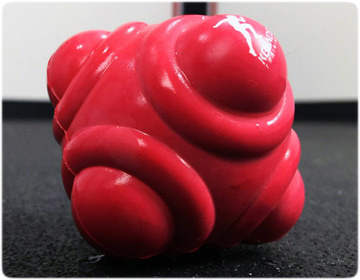 The Chaos Ball will enhance baseball and softball player's ability to quickly react to a bad hop during competition. It is important infielders train to react to a bad hop. By building hand eye coordination with the Chaos Ball, infielders will enhance their ability to manage a bad hop and make the play needed. The Chaos Ball can be used during team practices or during individual infield training session.